The Caribbean Sea is a tropical sea in the Western Hemisphere, part of the Atlantic Ocean, southeast of the Gulf of Mexico. It is located between latitudes 9° and 22° N and longitudes 89° and 60° W. It covers an area of about 1,063,000 square miles. The Caribbean Sea covers most of the Caribbean Plate and is bounded on the south by South America, on the west and south by Mexico and Central America, and on the north and east by the Antilles: the Greater Antilles islands of Cuba, Hispaniola, Jamaica, and Puerto Rico lie to the north, and a plethora of Lesser Antilles bound the sea on the east. The entire area of the Caribbean Sea, the numerous islands of the West Indies, and adjacent coasts, are collectively known as the Caribbean. The sea's deepest point is the Cayman Trough, between Cuba and Jamaica, at 7,686 m (25,220 feet) below sea level. There are five basins within the Caribbean Sea, they are the Yucatán, Cayman, Colombian, Venezuelan, and Grenada basins. The Caribbean coastline has many gulfs and bays: the Gulf of Venezuela, Gulf of Darien, Golfo de los Mosquitos and Gulf of Honduras. 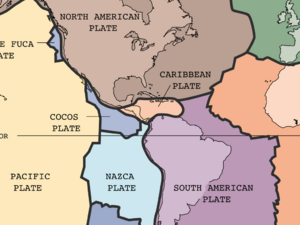 Detail of tectonic plates from: Tectonic plates of the world. 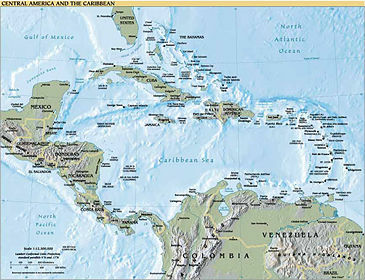 The Caribbean Sea is largely situated on the Caribbean Plate. Estimates of the sea's age range from 20,000 years to 570 million years. The Caribbean Sea floor is divided into five basins separated from each other by underwater ridges and mountain ranges. The Atlantic Ocean enters the Caribbean through the Anegada Passage lying between the Lesser Antilles and Virgin Islands and the Windward Passage located between Cuba and Haiti. The deepest points of the sea lie in Cayman Trough with depths reaching approximately 7,686 m (25,220 feet). Despite this, the Caribbean Sea is considered a relatively shallow sea in comparison to other bodies of water. The Caribbean Sea floor is also home to two oceanic trenches: the Hispaniola Trench and Puerto Rico Trench, which put the area at a higher risk of earthquakes. Underwater earthquakes pose a threat of generating tsunamis which could have a devastating effect on the Caribbean islands. Scientific data reveals that over the last 500 years the area has seen a dozen earthquakes above 7.5 magnitude . Average sea surface temperatures for the Caribbean Atlantic Ocean (August 25-27 2005). The Caribbean weather is influenced by the Gulf Stream and Caribbean Current ocean currents. The Caribbean current is a warm water current that flows into the Caribbean Sea from the east along the coast of South America. The Gulf Stream is a powerful, warm, and swift Atlantic Ocean current that originates in the Gulf of Mexico, exits through the Strait of Florida, and follows the eastern coastlines of the United States and Newfoundland before crossing the Atlantic Ocean. 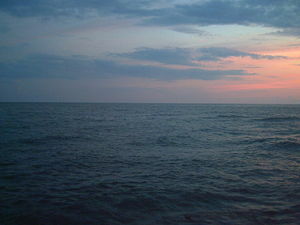 The tropical location of the sea helps the water to maintain a warm temperature ranging from the low of 70 to mid-80 degrees Fahrenheit by the season. The Caribbean is a focal area for many hurricanes within the Western Hemisphere. A series of low pressure systems develop off the West coast of Africa and make their way across the Atlantic Ocean. While most of these systems do not become tropical storms, some do. The tropical storms can develop into Atlantic Hurricanes, often in the low pressure areas of the eastern Caribbean. The Caribbean hurricane season as a whole lasts from June 1 and ends November 30, with the majority of hurricanes occurring during August and September. On average, around 9 tropical storms form each year, with five reaching hurricane strength. According to the National Hurricane Center 385 hurricanes occurred in the Caribbean between 1494 and 1900. Every year, hurricanes represent a potential threat to the islands of the Caribbean, due to the extremely destructive nature of these powerful weather systems. Coral reefs can easily be damaged by violent wave action, and can be destroyed when a hurricane dumps sand or mud onto the a reef. When this happens, the coral organisms are smothered and the reef dies and ultimately breaks apart. The name "Caribbean" is derived from the Native Caribs, one of the dominant Amerindian groups in the region at the time of European contact during the late 15th century. After the discovery of the West Indies by Christopher Columbus in 1492, the Spanish term Antillas was commonly assigned to the lands; stemming from this, "Sea of the Antilles" is a common alternate name for the Caribbean Sea in various European languages. The Caribbean Sea was an unknown body of water to the populations of Europe and Asia until 1492 when Christopher Columbus first sailed into Caribbean waters while trying to find a route to India. At that time the Western Hemisphere in general was unknown to Europeans. Following the discovery of the islands by Columbus, the area was quickly colonized by several Western Civilizations. During the first century of development, Spanish dominance was undisputed. Following the colonization of the Caribbean islands, the Sea became a busy area for European-based marine trading and transport, which eventually attracted piracy. The era of piracy in the Caribbean began in the 1560s and died out only around the 1720s as the nation-states of Western Europe with colonies in the Americas began to exert more state control over the waterways of the New World. The period during which pirates were most successful was from the 1640s until the 1680s. Piracy flourished in the area because of British seaports such as Nelson's Dockyard, Antigua, and ports in Barbados. Today the area is home to 22 island territories and borders 12 continental countries. Because of an abundance of sunshine, year-round tropical temperatures moderated by the almost constant trade winds, and the great variety of scenic destinations to visit, during the second half of the twentieth century on into the twenty-first century, the Caribbean Sea became a popular place for tourism, and this trend has favored the in creasing development of the cruise industry in the area. Human activity in the area also accounts for a significant amount of pollution, Pan American Health Organization estimating in 1993 that only about 10% of the sewage from the Central American and Caribbean Island countries is properly treated before being released into the Sea. The Caribbean region has a spanned a large tourist industry. The Caribbean Tourism Organization calculates that about 12 million people a year visit the area, including (in 1991–1992) about 8 million cruise ship tourists. The area is also the setting for the well-known Disneyland and Disney World attraction, Pirates of the Caribbean, which among other things is notable for cementing the alternative pronunciation (with the stress placed on the first and third syllables instead of the second) in many people's minds. The ride has been adapted into a trilogy of Pirates of the Caribbean films, the first two of which take place in the Caribbean. The nations of Belize and Guyana, although on the mainland of Central America and South America respectively, were former British colonies and maintain many cultural ties to the Caribbean and are members of CARICOM. The Turneffe Islands (and many other islands and reefs) are part of Belize and lie in the Caribbean Sea. The USA, Canada, China and the European Union play a large role in the Caribbean economy and politics. It is rare for any part of the US coastline to be considered part of the Caribbean as they are located in parts of the Gulf of Mexico. Caribbean Disaster Emergency Response Agency (CDERA) Barbados Retrieved July 28, 2007. Caribbean Hotel Association (CHA) Puerto Rico Retrieved July 28, 2007. Caribbean Regional Fisheries Mechanism (CRFM) Belize Retrieved July 28, 2007. Caribbean Tourism Organisation (CTO) Barbados Retrieved July 28, 2007. ↑ Shelley Dawicki. March 25, 2005. Tsunamis in the Caribbean It's Possible, Oceanus. Retrieved July 28, 2007. ↑ World Resource Institute. Status of coral reefs in the Caribbean and Atlantic Ocean, Retrieved July 28, 2007. ↑ CBS News. November 3, 2005. Bleaching Threatens Caribbean Coral Reefs. Retrieved July 28, 2007. ↑ BBC News. September 22, 2004. Alarm sounded for Caribbean coral, Retrieved July 28, 2007. ↑ NOAA Fisheries: Office of International Affairs. Protocol Concerning Specially Protected Areas and Wildlife to the Convention for the Protection and Development of the Marine Environment of the Wider Caribbean Region (SPAW), Retrieved August 14, 2007. ↑ Orion Grassroots Network.Caribbean Conservation Corporation, Retrieved August 14, 2007. ↑ Gutro, Rob. September 6, 2005. 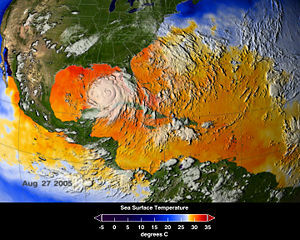 NASA Satellites Record a Month for the Hurricane History Books, NASA. Retrieved August 14, 2007. ↑ Caribbean Environment Programme. August 21, 2001. An Overview of Land Based Sources of Marine Pollution, Retrieved July 28, 2007. ↑ NOAA Fisheries Northeast Fisheries Science Center Narragansett Laboratory. June 2, 2003. Caribbean Sea Marine Ecosystem, Retrieved July 28, 2007. This page was last modified on 11 January 2017, at 16:32.